“On that long-ago Christmas Day, the morning sun rose strong and bright through the window. With each ray of sunlight the spider’s spinnings and weavings began to shimmer and glimmer like a tapestry of gold and silver. A humble mother and her children stood in silent wonderment at the miraculous sight before them…. Since it’s a busy, present-filled, head-exploding kind of day for my own daughters (the seven-year-old was particularly fun to shop for, since she wanted “books, art supplies, and journals”), I’m just here to wish you a Merry Christmas and then head on my way — and to share some art, of course. 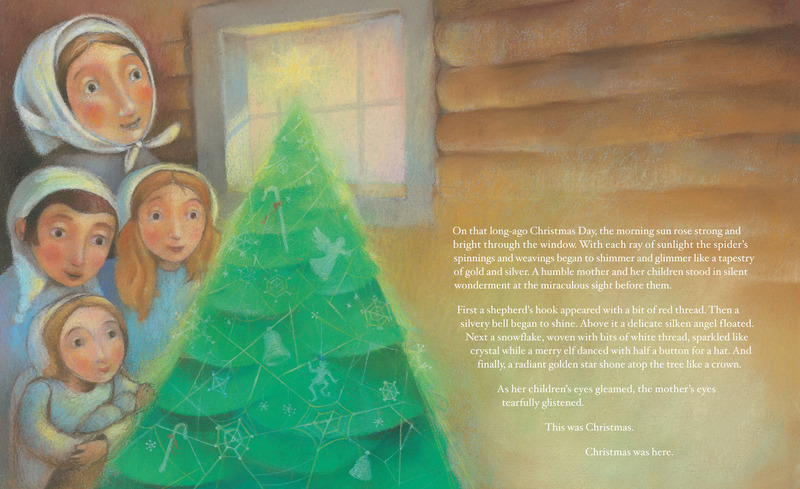 Today’s illustration comes from Trinka Hakes Noble’s A Christmas Spider’s Miracle, illustrated by Stephen Costanza (Sleeping Bear Press, September 2011), which Kirkus describes as an “appealing story with a magical aura spun by the shimmering illustrations and memorable story.” Shimmering, indeed. 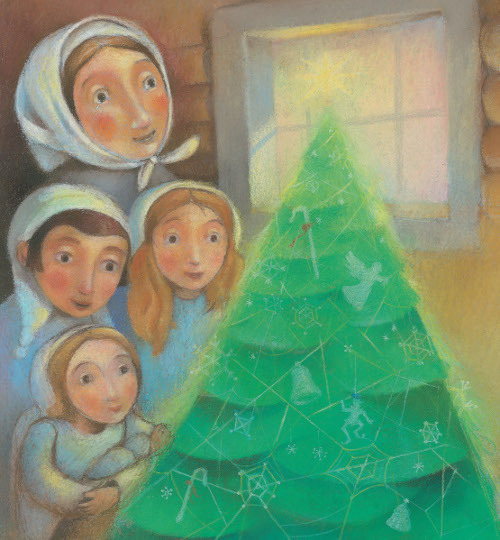 This is a contemporary adaptation of a Ukrainian folktale about one bleak winter, one impoverished mother of three, living in a small cottage in the Ukraine, and one mother spider “who knew nothing of Christmas.” The mother spider had established her home in a small fir tree, as she knew it wasn’t safe to live in a house. When the human mother, late into the night on Christmas Eve, brings that fir in to her “tumbledown cottage”—the only gift she can give her children—the mother spider brings the family her own unique and particularly lovely present, as you can see in the illustration above. I hope everyone, no matter what you celebrate and where you are, is having a happy day. I’m feeling kicky for the health and happiness of my children and that I’m fortunate enough to give them a present or two on Christmas Day. How about you? A CHRISTMAS SPIDER’S MIRACLE. © 2011 by Trinka Hakes Noble. Illustrations © 2011 by Stephen Costanza. Published by Sleeping Bear Press, Ann Arbor, Michigan. Image reproduced by permission of the publisher. I attended a beautiful Christmas eve service with friends of more than 30 years and their daughter last night complete with a living Nativity and a candlelight singing of Silent Night. I feel fortunate to have a home, a wonderful calling in the field of school librarianship for almost 34 years now (and still employed when so many certified people are being replaced), a beautiful loving chocolate lab, Xena, a crackling fire in the fireplace, a cup of tea, homemade lemon bread and loads of virtual friends who enjoy and love what I do. Best wishes Jules and thanks for all you do. I really enjoyed your article on 2012 and children’s books. We live on the Bois Forte Reservation in northern Minnesota and there is a Chippewa legend that tells of a spider weaving its beautiful web in a Christmas tree! Interesting to hear it here too as a Ukranian folktale! Jules, I read A Christmas Spider’s Miracle, what a wonderful tale. The pictures are so beautiful. I hope your Christmas is joyful. 7-y-o’s are a blast to by for, agreed! Yesterday was spent w/ daughter’s family and the joy of watching the oldest grandgirl’s two older half sisters as they opened autographed YA books along with grandgirl. And grandgirl squealed in delight with her presents. The joy of simplicity, love, and peace. This online community. See you in the new year. Margie, merry Christmas! I think readers like you are extra kicky. K. Lasley: Neat. I didn’t know that it was a Chippewa legend as well. It was the first time I’d ever heard the tale. I wonder how far back it goes … And I wonder if Farida Dowler knows. She is an excellent storytelling resource. Jone, merry Christmas! Hear, hear to the online community! Enjoy the time with your grandchildren! I hope you and your whole households — Jules and all Kickers — have a lovely day today, and look forward to all the new sights and sounds and feelings of the coming year’s kicks. This is such a great place to come by on a Sunday, isn’t it? John: Well now. That hadn’t even occurred to me — the Festivus thing, that is. Funny. Even though it’s supposed to be kicky on Sundays, folks are welcome to complain, too. Love the idea of connecting Christmas to nature in this way, and love the wonder on the faces of the children as they discover that beautiful gift. K. Lasley, I’m from Thunder Bay, which is right above Minnesota. Used to go to Chippewa pow-wows when I was little. So well said, Jules, about feeling fortunate. Smells of chicken and dumplings, 8 yo reading his new book (for hours!) and 6 yo learning how to use her kid-sized sewing machine. Peaceful music playing, ad grandparents on the way. I’m always intrigued by spiderwebs; neat that this tale has echoes in two cultures. I like how the illustrated tree seems to glow on the page. Back to the bustle now… Have a wonderful holiday break everyone! So, so cool that we al stop by even on Christmas. Saw Hugo today. Perfect movie to see. Love the illustrations and that the tale is one that is indifferent cultures. My big kick, spending Christmas eve with friends in Oregon wine country, and waking this morning before sunrise to see the fog rolling in over the vineyards. It was so gorgeous and peace-inducing. Made me feel so very lucky to be there to see it. Jessica, sounds like you found the perfect gift for your children. Enjoy the time with the parental units! Denise, I’m afraid wordy ‘ol me would be a bad editor. Where’s Little Willow when you need her? Sounds like your bustly holiday was a good one. Jone, loved Hugo. So so much. When he looks up at conductor guy and says, I don’t know why I lost my dad and I don’t know why I’m alone, I had to stop myself from sobbing right then and there. Rachel, wow. Sounds so wonderful. Drink some wine for me. p.s. I can’t believe ANYone stopped by on Christmas Day. Thanks! Fly-by posting! HAPPY HOLIDAYS to all of the Imps and their precious ones! Anyone in need of a laugh should watch Catherine Tate and David Tennant. It will never get old.